sweettalk wrote: i know it wasn't considered a real race, but should this finish be worrying at all? i'm not super familiar with how barrier trials work/are analysed/etc. No. Its essentially just a gate workout but with other horses. Each horse just goes out and does what the connections want, none of the horses were asked to do anything. As far as I know, she has only won one barrier trial ever and that was in August 2017. And especially if both trainer and jock are pleased with her, it's really nothing to be concerned with. I think barrier trials are a bit more interesting/a bigger deal for the 2yo newcomers and maidens. Winx's regular rider, Hugh Bowman, will not be up for her first start of the year due to a couple of riding suspensions for Bowman. 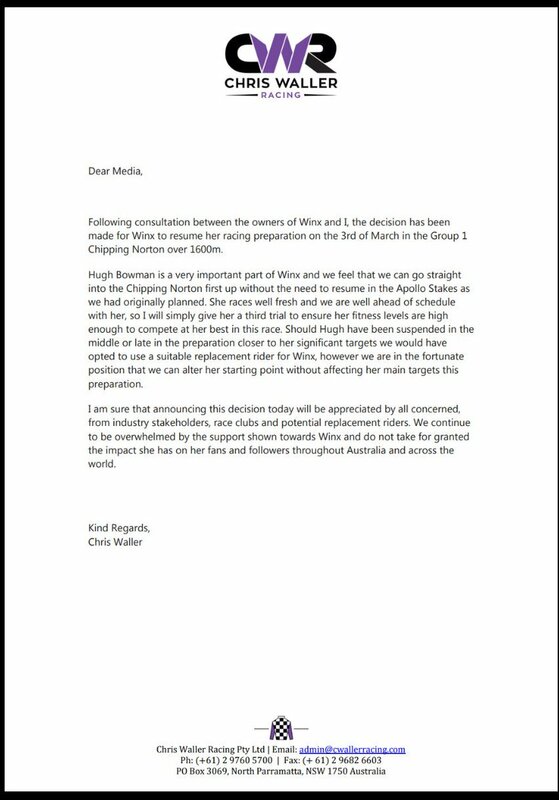 Please see below a media update from the stable in relation to Winx and Hugh Bowman. He's lucky that they value him so much that they changed the horse's schedule to accommodate his multiple bans for careless riding. He did end up appealing the one Australian ban, but lost. Are there any other examples of this happening in recent memory? Genuinely asking. I mean, Anthony Oppenheimer said he was reluctant to run Cracksman in last year's Arc because Frankie Dettori was already booked for Enable, but the horse didn't end up running for a multitude of reasons. I moved recently, and no longer have TVG & TVG2. Is there somewhere I can watch her on live stream tonight? The race is technically on Saturday...in Australia. The race will broadcast on Friday night here in the US. There may be a way to watch the Royal Randwick race card on an Australian racing internet site. Wish I could remember the web address. For fans watching from North America, Winx's race is scheduled for 11:30 PM Eastern/8:30 PM Pacific tonight. oh she ran right by them like they were statues. And she was last out of the gate. The jockey didn't move a muscle or touch her. That's 16 G1s, and 3 Chippping Norton's. Last edited by MySaladDays on Sat Mar 03, 2018 12:33 am, edited 1 time in total. MySaladDays wrote: Staying up late for this one. Going for her 23rd conseq win. "One punter has total faith in the mare winning again, plonking $108,000 on her to win for a return of $6480......"
I know TVG has announced that they're not taking show wagering on her race. I'm watching on TVG, but if you don't have that, there was an Oz website posted earlier in this thread. If that's a horse who 'might be only 75%,' then what is she going to do when 90-95%? Sit and steer, Hugh. 23 straight wins! sorry I was on the page and forgot about it. That's 16 G1s, and 3 Chippping Norton's, 3 Cox Plate's and 23 consequetive wins. BaroqueAgain1 wrote: If that's a horse who 'might be only 75%,' then what is she going to do when 90-95%? Never did I ever think I'd even see Black Caviar's record broken. I've seen every win by this amazing mare, and I cannot honestly think other than the '16 Cox Plate, a race won by such EASE. Went from zero to 90 in three seconds. The acceleration is ridiculous. She is crazy. What can you say? What other records does she have left to break? She's already the best horse to ever grace Australian turf. I had a lump and a tear watching that.